Temple Grandin is one American icon who either rubs you the right way or wrong way…or somewhere in between on the ethical spectrum of animal welfare and protection. Best known for using her autism to relate to farm animals and improve their treatment on feedlots and factories with better designed chutes, slaughtering methods and other practices, this biography written by vegetarian author Sy Montgomery does a remarkable job in telling a complex story for a young audience. Grandin’s youth was mired by a father who thought she should be sent to a nuthouse and a loving mother who did her best to understand her child that could not communicate or bond like a typical toddler. Montgomery chronicles Grandin’s life from this trying youth through her adulthood by weaving together the results of her interviews with Temple’s friends, co-workers, and family. 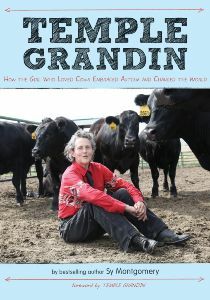 Not only does she cover Grandin’s unique developmental process (learning to read facial expressions, finding refuge and comfort in enclosed spaces, building amazing things with her carpentry skills), but she also incorporates into the biography Grandin’s close ties to the animal kingdom – the horses she cared for in a boarding school and the cows she effortlessly understood and connected with. It’s with this love of bovines and a common ground of an autistic-like experience, “seeing in pictures,” that moved Temple to eventually earn her PhD and become a world leader in changing the way farmers see, interact with and design their facilities for farmed animals. Montgomery also doesn’t shy away from the motivators and experiences that keep Grandin on track and working 7 days a week on her efforts for farmed animals. The reflections on a kosher slaughterhouse are particularly disturbing, but readers soon learn that the nation’s top kosher facilities have now implemented Grandin’s designs, thus reducing a tremendous amount of pain, suffering and fear. This is a very unique work in the sense that there aren’t many biographies for youth available that talk about efforts for animals. Readers of this particular portrait will see autism in a whole new light and appreciate Grandin for the creative, innovative person that she is. If anything, this is a great, challenging, and thought-provoking read that will enlighten anyone to a new way of seeing and living. Houghton Mifflin Harcourt provided a review copy. I have very mixed feelings about Grandin, too…and I’m doubtful of most people who tell me they HAVE to eat meat or else their “special enzymes” or whatever will fail and they will fall ill.
A very thought-provoking book and a wonderful review, thanks for writing.